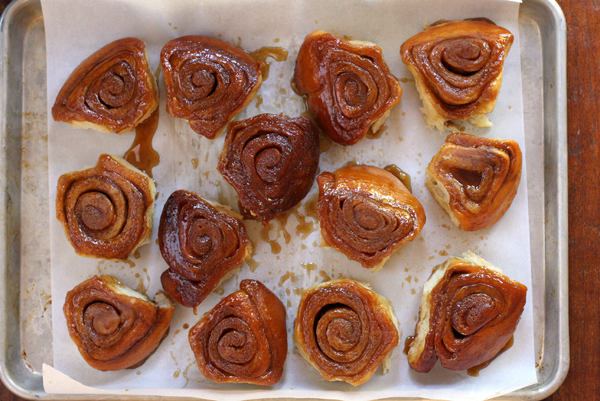 I have a wonderful recipe for easy overnight caramel rolls that I have made often for a few years now. My friend Amy gave it to me once and it is one of my favorite things. But, I can never settle for one good recipe for something when I can have 2! This one is a bit more ‘from-scratch’ which also means it is a bit more time-consuming. Not horribly, with the help of a bread maker whipping up the dough, but still. Sometimes you just want to get into the kitchen and get my hands dirty, you know? Scooping and measuring and melting and rolling… playing with my food and enjoying my kids playing next to me. Ignoring all the ‘stuff’ that needs to be done and just celebrating life in this moment. These are life-celebrating caramel rolls. 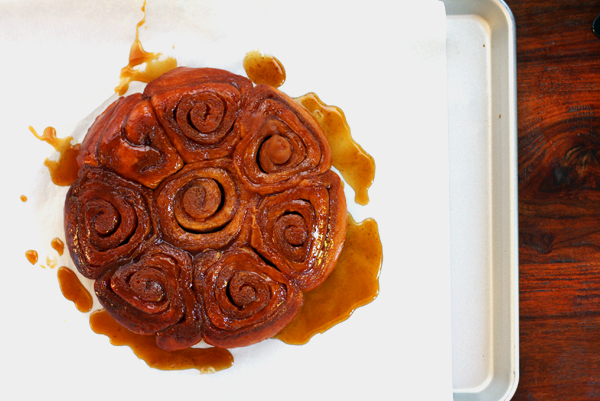 For the almost effortless, overnight caramel rolls, click here! Add the ingredients to your bread maker following your manufacturers instructions. (Mine goes like this: Egg/water on the bottom, then flour, dry milk & sugar on top, leveled out. Salt along both edges, butter cubed and pressed into the corners and yeast dumped into a small well formed in the center of the flour.) Set to the DOUGH setting at let it do it's thing! While the dough is doing its thing, grease 2 round deep dish pie plates or cake pans. In a small bowl, stir together the corn syrup (or agave), melted butter & vanilla until well combined. Divide this mixture between the two pans, tilting to cover the bottoms evenly. Sprinkle each pan with 1/2 cup brown sugar, and then the pecans if you're using them (and please do!! I was out of pecans but I would never leave them out on purpose!). When the dough is done, take it out of the machine and let it rest on a floured surface for about 10-15 minutes. On that floured surface, roll the dough out into a large rectangle (10"x14", or something like that). Spread the 4 tablespoons softened butter all over the rolled out surface and then sprinkle evenly with the sugar and cinnamon. Starting on the long end closest to you, roll the dough away from you into a log. VERY gently with a sharp serrated knife, cut the log into 16 equal pieces. (Cut the log in half, then each half again, then again and again). Place the pieces into the prepared baking dishes, 8 rolls into each pan. Cover the pans with plastic wrap and let them sit in a draft-free place to rise for about an hour. Once the rolls have expanded in the pans so that they are all touching, place the pans in a preheated 350ºF oven. Bake for 15 minutes, then cover loosely with foil and bake for another 10-15 minutes, until the rolls are golden brown and no longer doughy in the center. Remove the pans from the oven and immediately invert them onto large platters or parchment. (Hold the hot pan in one hand with a baking mitt, place a large plate on top and then flip quickly, all-in-one motion). Let the pans sit there upside down for a few minutes to make sure all the caramel and pecans fall down onto the rolls.